Several deliveries back we had an incident involving train tracks, the trailer and poorly secured glass, so we changed our methods for securing glass to our trailer. 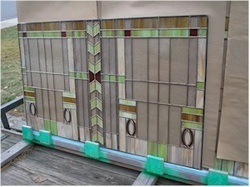 If you'd like to see the article on how we repaired the damaged panel click here. 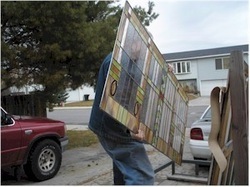 We had several panels to deliver to Fondell woodwork so they could mount the panels into wood frames that they built. 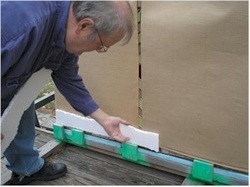 I put a sheet of drywall against the glass rack so that pressure would be spread evenly against the glass. You can see the 1" blue insulation on the bottom of rack to protect against bouncing as the trailer rolls along. 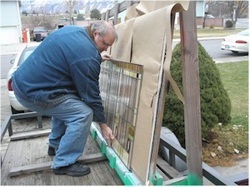 After covering the first panel with protective paper, I loaded the next panel in place. 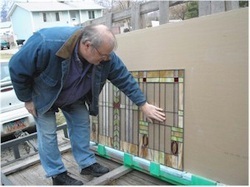 Each panel rests directly over the last since they are all the same size. 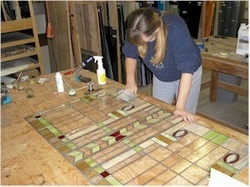 As I load the panels, Jeanne gives each a final cleaning. With all the panels loaded, the stack comes close to the wood tabs that keep glass from slipping off the edge of the rack. I find some styrofoam packing that fits right in between the glass and the wood tabs. 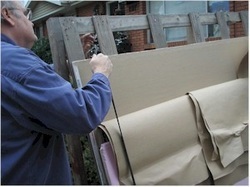 Then I lay up a cut sheet of 1" insulation board. 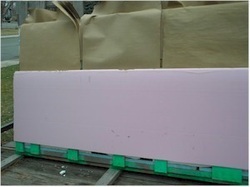 This forms a compact stack of drywall, glass and insulation that will protect the whole pile. I tip all the paper ends over the outside of the stack and begin placing bungee cords on the stack. 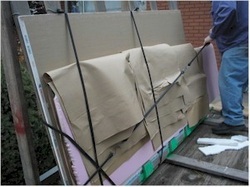 This forms a very tight hold so that if the trailer bounces, the entire load will bounce, similar to holding a coin between your hands and holding it tightly. 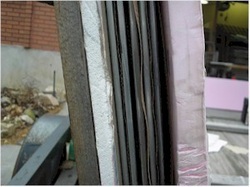 Because the drywall protects from the back and the insulation protects from the front, there are no stress points on the glass while it's held securely in place. 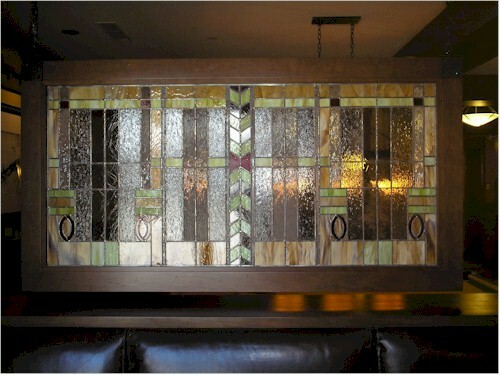 The glass was delivered without incident and the framed glass hangs proudly in the Deer Valley ski lodge in Park City, Utah.